WASHINGTON – US President Barack Obama announced Monday that White House Chief of Staff William Daley was stepping down after a short and rocky tenure of just one year. Jack Lew, an Orthodox Jew who currently serves as director of the Office of Management and Budget – a post he also filled during the Clinton administration – has been named his successor. Lew previously served as Obama's deputy secretary of state. "Jack has had one of the other most difficult jobs in Washington," Obama said. "Jack’s economic advice has been invaluable and he has my complete trust, both because of his mastery of the numbers, but because of the values behind those numbers." William Daley's year as Obama's proverbial gatekeeper included notable moments like the killing of al-Qaeda terrorist leader Osama bin Laden, but also included internal grumbles that the top aide had not turned out to be the right man for the job. Obama said he took the news reluctantly, initially refusing to accept Daley's resignation letter and ordering him to think it over. But Daley stood by the decision, expressing a desire to be with his family and return to Chicago. "No one in my administration has had to make more important decisions more quickly than Bill, and that's why I think this decision is difficult for me," Obama said on Monday. Lew and Daley stood by the president but did not speak. The White House said neither man was giving interviews. Obama now plows ahead into an election year with his third chief of staff – one of the most influential and demanding jobs in US government and politics. Daley had come aboard last January to replace the colorful and involved-in-everything Rahm Emanuel, who left the job to run for Chicago mayor, a position he now holds. The transition from Daley to Lew is expected to take place at the end of the month. Just ahead for Obama are two crucial, tone-setting events: his State of the Union speech on January 24 and the release of his budget proposal in early February. 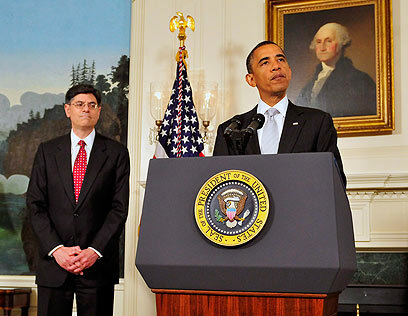 See all talkbacks "Obama names Jack Lew new chief of staff"